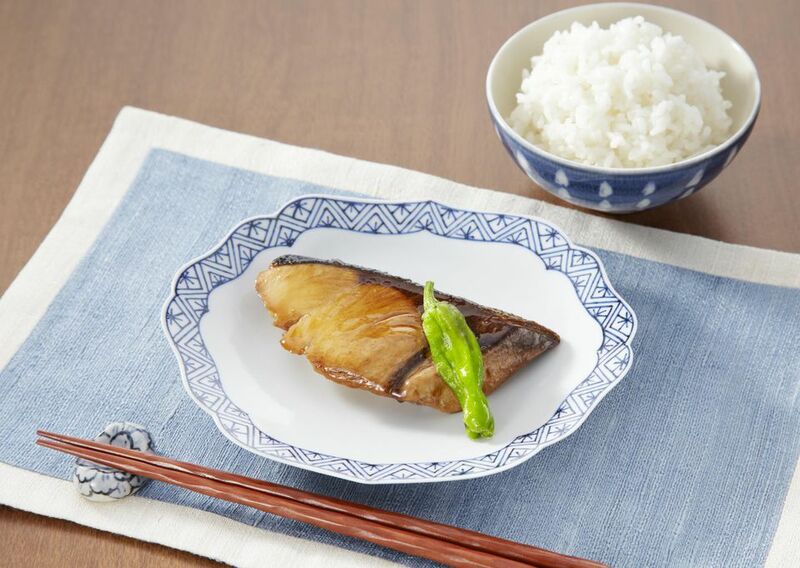 This is a traditional recipe for yellowtail, a type of jackfish also called Hamachi in Japan, glazed with teriyaki sauce made the old-fashioned way. Modern teriyakis are often too sweet and, while you need the sugar to help caramelize the sauce, too much makes a dish cloyingly sweet. Don't worry about the ​mirin needed here, as it is readily available in most supermarkets. This is a very simple recipe that takes very little time to prepare―and you can use other fish. We'd recommend tuna, swordfish, mackerel, striped bass, bluefish, catfish or cobia. To prepare the fish: Salt the fish steaks well and set aside at room temperature for 15 to 25 minutes. To make the teriyaki sauce: In a small pot, bring the sake, mirin and soy sauce to a boil and stir in the sugar. Turn off the heat and set aside. To cook the fish: Using a large saute pan, get the peanut oil almost to a smoking point over high heat. Run the edge of a butter knife along the skin side of the fish steaks, scraping off any moisture. Turn the heat down to medium-high and lay the fish steaks―skin side down―in the pan. You might need to press down on them with a spatula to keep the skin from arching up. It'll relax in a minute or so. Cook the fish 2/3 of the way on the skin side, then flip. It should come off easily, as the skin will be crispy. If you have skinless pieces of fish, just cook it 2/3 on one side. Pour in the teriyaki sauce and turn the heat down to medium. Spoon some on the skin side of the steak and cook for 2 to 3 minutes, longer if the steak is very thick. Flip the steak one more time to set the teriyaki glaze. Gently shake the pan so it doesn't stick. Cook for 1 minute. Serve immediately with steamed rice and a salad.